As we have grown in the Messianic/Hebrew roots perspective of Scripture, we have been blessed to have an ever increasing circle of fiends and acquaintances. Many are names you would be familiar with, but once in a while we run across an unknown gem that everyone needs to know for one reason or another. Anita Heist is one such lady. 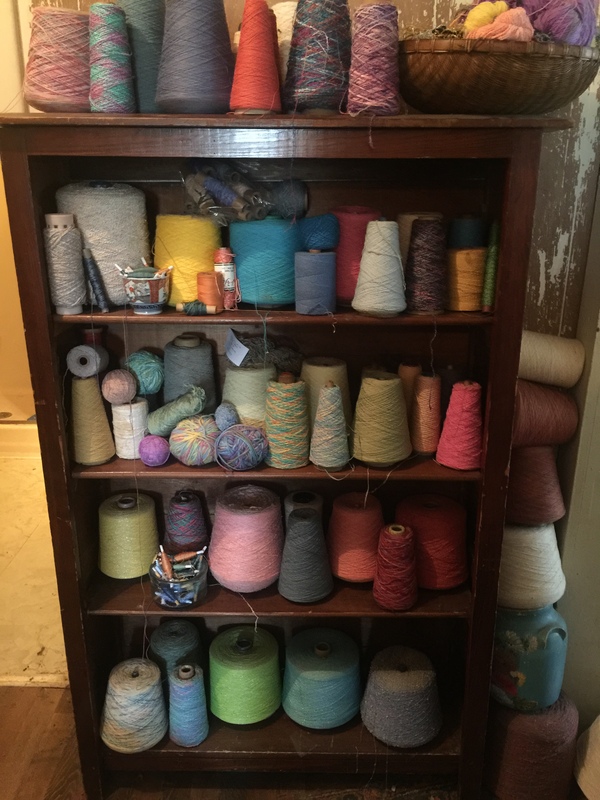 A pretty rack of colorful thread… She has TONS of thread in differing materials like cotton, linen, wool, etc. A senior lady who has been on this walk for most of her life, Anita is wonderfully gifted and knowledgeable. Her heart is to teach and her library and interests include a broad variety of sustainable and ancient technologies that would be a treasure in any community, but weaving is her passion. 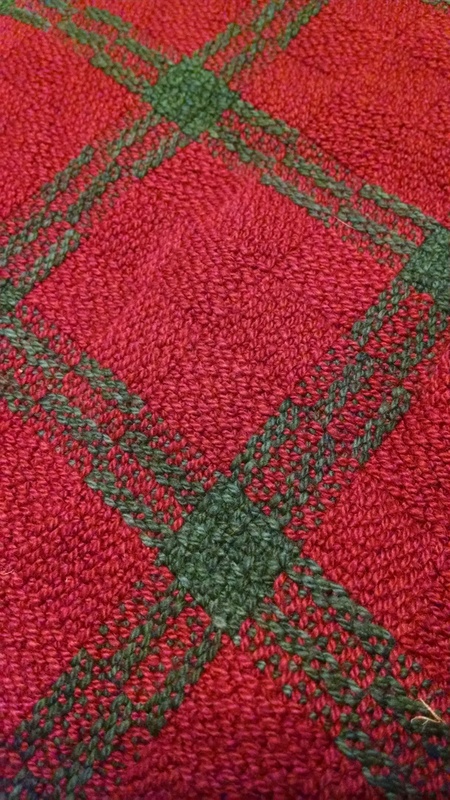 A world-class weaver who has been commissioned to reproduce exact matches to ancient garments and antique auto interiors, she has worked at the loom hand-weaving custom tallitot, challah covers, robes, and other Judaica for decades. Recently, Kelly and I along with Tommy and Dorothy Wilson had a chance to share a meal at her table as we passed through Athens, TN enroute to the B’ney Yosef Plenary Session. What a blessing that time was!! Without a doubt, I can attest, Anita is an Ephramite National Treasure! Detail of a pair of hand towels Anita wove for us. 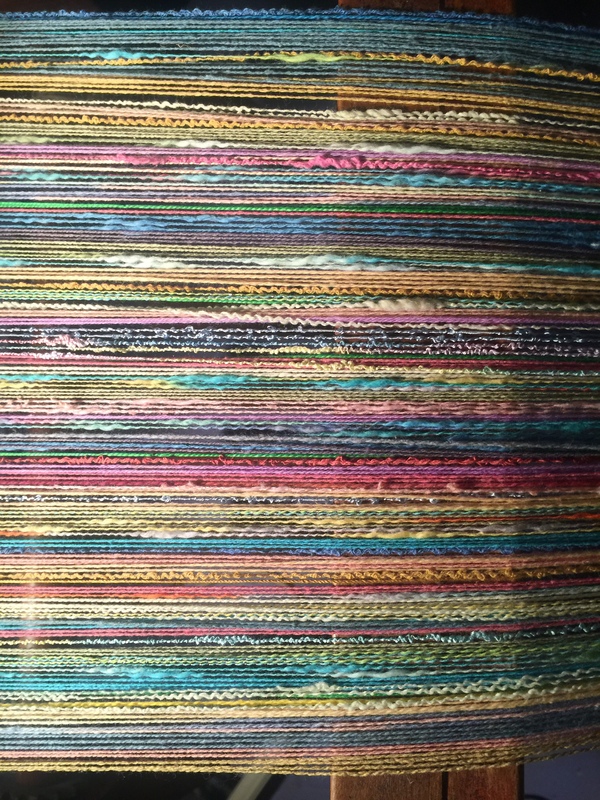 While there, we were privileged to touch and see many completed and ongoing projects as well as skeins of thread and catalog upon catalog of test swatches for thousands of completed works. We were also there to make decisions on a custom tallit she is making for Kelly. Kelly’s special tallit on the loom. Friday, I received the image to the right of the thread going on the loom and I asked for a few updated pics as she goes so I can share them with all of you!! When Anita weaves a custom piece, she really wants her customer to be involved in the decision making process. We were overwhelmed at the choices and thought going into the tallit, so visiting helped us so much in touching and trying various items she had. Choices include materials, colors, sizes, weave pattern, fringe styles, etc. Kelly’s love of pastel colors and linen clothing along with specific needs due to her disability led to her enthrallment with a particular garment (wearable tallit) Anita had on a sizing mannequin. After trying it on and determining it would not quite fit, Anita made several helpful suggestions and a design was agreed upon. The result of the collaboration was something we are very excited to see come to fruition. Anita’s habit is a lot of prayer and worship music as she weaves each tallit or garment, knowing each is her best work and a creation that will last for decades. Maybe generations. Many articles require up to 100 hours of work! That is a LOT of prayer! A closing note, Anita’s heart’s desire is to build a small studio where she can use her 20+ looms to teach her craft to interested individuals who can help preserve her knowledge among B’ney Yosef. Pray for her in this regard and see how our Father leads! This entry was posted in A Thought... and tagged custom tallit, custom weaving, handwoven, heirloom, learn to weave, loom. Bookmark the permalink. Twenty years ago, Abba gave me this verse: “And everyone who left houses, or brothers, or sisters, or father, or mother, or wife, or children, or lands, for My name’s sake, shall receive a hundredfold, and shall inherit everlasting life.” (Mat. 19:29) After experiencing the sense of FAMILY last weekend in Tampa, believe I am just now beginning to understand what the promise means. For everything that we have forsaken, we will be given back one-hundred fold. We have all had to leave behind houses of worship and the brethren that filled them, ministries, friends and relatives; but, His blessing is being poured out one-hundred fold. I believe that will also apply in business ventures. May Abba pour out HIs blessings upon our sister! Thanks, Pete and Kelly, for sharing! You might like to know: some older prayer shawls, challah covers, Torah bookmarks, kippot can be seen at http://www.beityosefdesigns.com. When I have the funds I will get new, real website up. Meanwhile, am paying off hospital bills for broken arm, and for tornado damage to house/temporary makeshift studio- and working toward having a studio building. Then you can come weave your own tallit, scarf, challah covers or whatever if you’d like to. :-). With guidance and help of course :-). What beautiful work! Chana is a very special and very gifted sister.